I want to start off this article by explaining that I’m not making this in an effort to gloat or brag, and I certainly hope it doesn’t come across that way. I put all of the creative energy I had left this semester into the project I’m about to dissect and discuss, so sadly I won’t be publishing a video this semester (as I’ve done for the past two semesters). One of the reasons I’m making this is because a lot of the reaction towards what I made included people asking how I made it and how long it took me, and trust me, we’ll go in depth on that. My first experience with high-grade virtual reality was a few weeks before the start of my sophomore year at UMass when my friend Kyle drove down to visit me, bringing along his HTC Vive after finding out that the only experience I’d had with VR was a cheap $20 adapter for my phone. There’s a consensus online that virtual reality as a concept is better pitched through firsthand experience rather than by word of mouth or marketing. The whole appeal of VR relies on subjective perception and organic optical illusions, so I can understand why a lot of people think the whole “you feel like you’re in the game” spiel sounds like nothing but a load of shallow marketing. Remember when Batman: Arkham Asylum came out and nearly every review of it mentioned that it made you feel like Batman? Yeah, well now there’s actually a Batman Arkham VR game, and I don’t doubt it probably does make you actually feel like you’re Batman. The experience I had with VR that night hit me hard, and I came to understand why so many people online were making it out to be such a big deal. Despite my skeptical mindset going in, I found that it’s just as immersive as many have made it out to be. 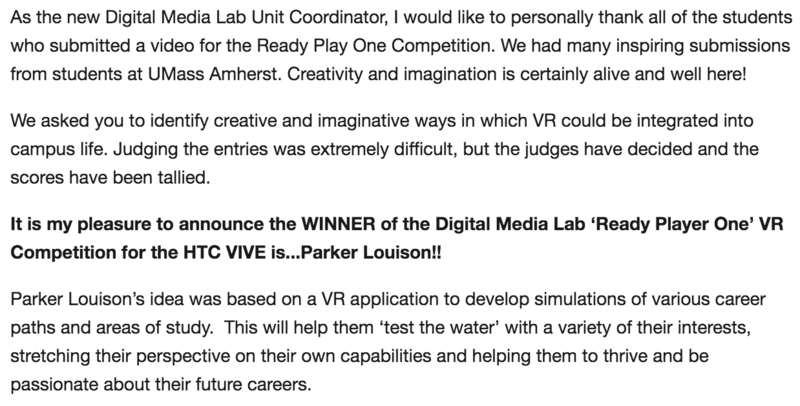 Anyway, I was sitting in my Comp-Lit discussion class when I got the email about the Digital Media Lab’s new Ready Player One contest, with the first place winner taking home an HTC Vive Headset. I’m not usually one for contests, and I couldn’t picture myself actually winning the thing, but something about the challenge piqued my interest. The task involved creating a pitch video, less than one minute in length, in which I’d have to describe how I would implement Virtual Reality on campus in a meaningful way. With Virtual Reality, there are a lot of possible implementations relating to different departments. In the Journalism department, we’ve talked at length in some of my classes about the potential applications of VR, but all of those applications were either for the benefit of journalists covering stories or the public consuming them. The task seemed to indicate that the idea I needed to pitch had to be centered more on benefiting the average college student, rather than benefiting a specific major (at least, that’s how I interpreted it). One of my original ideas was a virtual stress-relief dog, but then I realized that people with anxiety would likely only get even more stressed out with having to put on some weird giant headset… and real-life dogs can give hecking good nuzzles that can’t really be simulated. You can’t substitute soft fur with hard plastic. I came to college as a journalism major, and a day rarely goes by when I don’t have some doubts about my choice. In High School I decided on journalism because I won this debate at a CT Youth Form thing and loved writing and multi-media, so I figured it seemed like a safe bet. Still, it was a safe bet that was never pitched to me. I had no idea what being a journalist would actually be like; my whole image of what being a reporter entailed came from movies and television. I thought about it for a while, about how stupid and hormonal I was and still am, and realized that I’m kind of stuck. If I hypothetically wanted to switch to chemistry or computer science, I’d be starting from scratch with even more debt to bear. Two whole years of progress would be flushed down the toilet, and I’d have nothing to show for it. College is a place for discovery; where your comfortable environment is flipped on its head and you’re forced to take care of yourself and make your own friends. It’s a place where you work four years for a piece of paper to make your resume look nicer when you put it on an employer’s desk, and you’re expected to have the whole rest of your life figured out when you’re a hormonal teenager who spent his savings on a skateboard he never learned how to ride. And so I decided that, in this neo-cyberpunk dystopia we’re steadily developing into, it would make sense for simulations to come before rigorous training. Why not create simulated experiences where people could test the waters for free? Put themselves in the shoes of whatever career path they want to explore to see if the shoes fit right, you know? I mentioned “cyberpunk” there earlier because I have this weird obsession with cyberpunk stuff at the moment and I really wanted to give my pitch video some sort of tongue-in-cheek retrograde 80s hacker aesthetic to mask my cynicism as campy fun, but that had to be cut once I realized I had to make this thing under a minute long. Anyway, I wrote up a rough script and rented out one of the booths in the Digital Media Lab. With some help from Becky Wandel (the News Editor at WMUA) I was able to cut down my audio to just barely under the limit. With the audio complete, it came time to add visual flair. I originally wanted to do a stop-motion animated thing with flash-cards akin to the intros I’ve made for my Techbytes videos, but I’m slow at drawing and realized that it’d take too much time and effort, which is hilarious because the idea I settled on was arguably even more time-consuming and draining. I’m the proud owner of a Nikon D80, a hand-me-down DSLR from my mom, which I bring with me everywhere I go, mostly because I like taking pictures, but also because I think it makes me seem more interesting. A while back I got a speck of dust on the sensor, which requires special equipment to clean (basically a glorified turkey baster). I went on a journey to the Best Buy at the Holyoke Mall with two friends to buy said cleaning equipment while documenting the entire thing using my camera. Later, I made a geeky stop-motion video out of all those photos, which I thought ended up looking great, so I figured doing something similar for the pitch video would be kind of cool. I messaged a bunch of my friends, and in a single day I managed to shoot the first 60% of the photos I needed. I then rented out the Vive in the DML and did some photoshoots there. I then knew what I had to do. It was too late to change my idea or start over, so I instead decided that my best shot at winning was to make my video so stylistically pleasing and attention-grabbing that it couldn’t be ignored. If I wasn’t going to have the best idea, then gosh darn it (I can’t cuss because this is an article for my job) I was going to have the prettiest graphics I could muster. 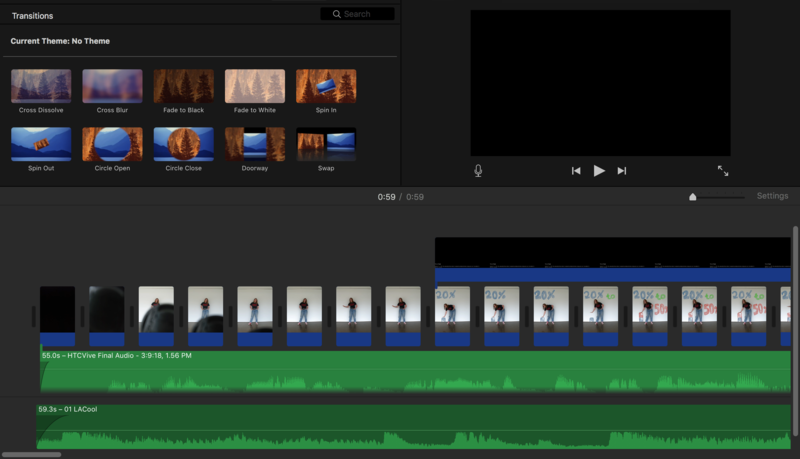 I decided to use a combination of iMovie and Photoshop, programs I’m already familiar with, because teaching myself how to use more efficient software would ironically be less efficient given the short time frame I had to get this thing out the door. Using a drawing tablet I borrowed from my friend Julia, I set out to create the most complicated and ambitious video project I’ve ever attempted to make. A few things to understand about me: when it comes to passion projects, I’m a bit of a perfectionist and extremely harsh on myself. I can’t even watch my Freshman Year IT video because I accidentally made it sound like a $100 investment in some less than amazing open back headphones was a reasonable decision on my part, and my other IT video makes me cringe because I thought, at the time, it’d be funny to zoom in on the weird hand motions I make while I talk every five seconds. So in this case, I didn’t hold back and frequently deleted whole sections of my video just because I didn’t like how a single brush stroke animated (with the exception of the way my name is lopsided in the credits, which will haunt me for the rest of my life). 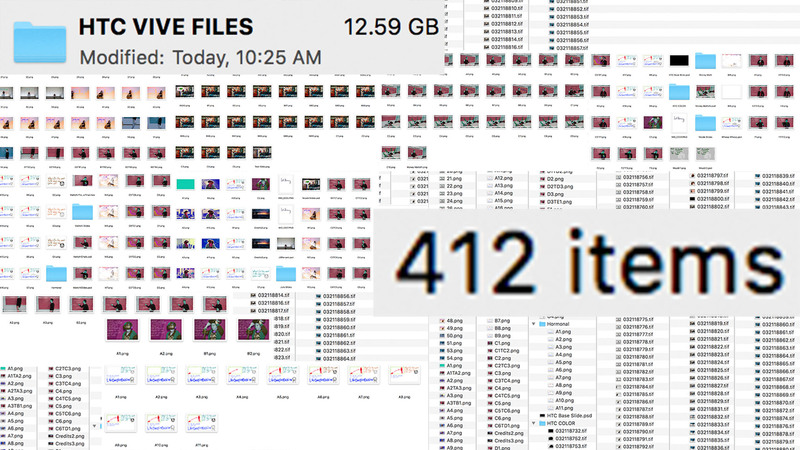 For two weeks, I rigorously animated each individual frame in Photoshop, exported it, and imported it into iMovie. The most demanding section was, without a doubt, the one involving my friend Matthew, which I spent one out of the two weeks entirely focused on. For that section, I needed it to animate at a speed faster than 0.04 seconds, which is impossible because 0.04 seconds is the shortest you can make a frame in iMovie’s streamlined interface, so I ended up creating a whole new project file, slowing down my audio by half-speed, editing the frames of that section relative to that slowed down audio before exporting it, putting it into the original project file and doubling its speed just to get it to animate smoothly. 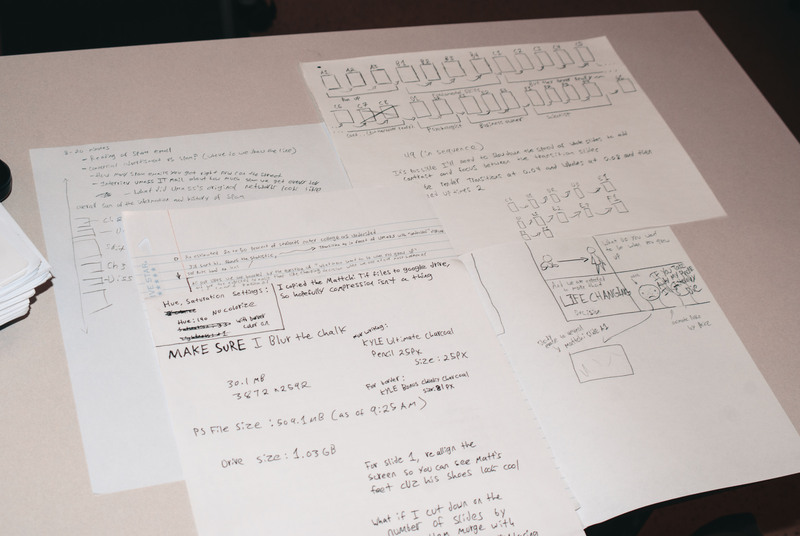 Each individual border was drawn multiple times with slight variations and all the on-screen text (with the exception of the works cited) was handwritten by me multiple times over so that I could alternate between the frames of animation to make sure everything was constantly moving. This was one of my major design philosophies during the development of this project: I didn’t want there to be a single moment in the 59 seconds where nothing was moving. I wanted my video to grab the viewer’s attention, and I feared that losing momentum in the visual movement would cause me to lose the viewer’s interest. The song LACool by DJ Grumble came on my Spotify radio coincidentally right when I was listening over the audio for the section I was editing, and I thought it fit so well I bought it from iTunes on the spot and edited it in. 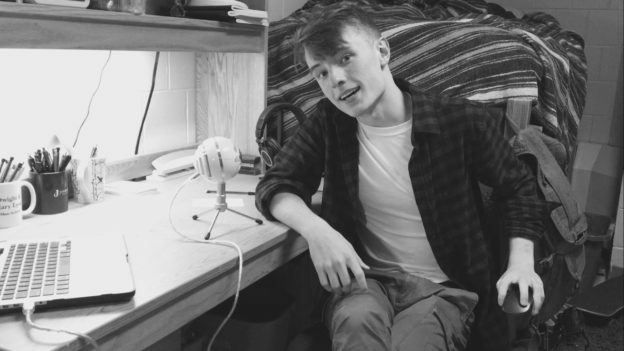 I finished my video on Monday, March 26th, turned it into the Digital Media Lab, stumbled back to my dorm, and went to bed at 6:00 PM by accident. 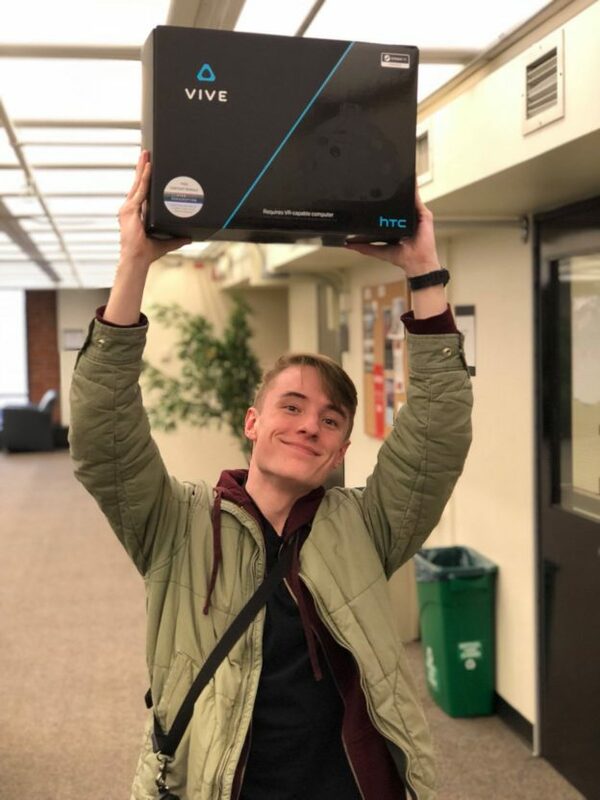 The winner wouldn’t be announced until Wednesday, so for two days I nervously waited until 6:00 PM on March 28th, when I sat on my bed in my dorm room refreshing the Digital Media Lab website every 7 seconds like a stalker on an ex’s Facebook page waiting for the winner to finally be posted. At 6:29 PM I got a call from an unrecognized number from Tallahassee, Florida, and almost didn’t answer because I thought it was a sales call. Turns out it was Steve Acquah, the coordinator of the Digital Media Lab, who informed me that my video won. Soon after, the Digital Media Lab Website was also updated with the announcement. Along with the raw joy and excitement came a sort of surreal disbelief. Looking back on those stressful weeks of work, it all felt like it flew by faster than I could’ve realized once I got that phone call. I’m so grateful for not only the reward but the experience. Making that video was a stressful nightmare, but it also forced me to push myself to my creative limits and challenge myself in so many ways. On a night where I would’ve probably just gone home and watched Netflix by myself, I sprinted around campus to meet up with and take photos of my friends. This project got me to get all my friends together and rent out the Vive in the DML, basically forcing me to play video games and have fun with the people I love. While the process of editing it all together drove me crazy, the journey is definitely going to be a highlight of my time at UMass. I’m grateful to all of my friends who modeled for me, loaned me equipment, got dinner with me while I was stressing out over editing, played Super Hot VR with me, gave me advice on my audio, pushed me to not give up, and were there to celebrate with me when I won. I’m also immensely grateful to the staff and managers of the DML for providing me with this opportunity, as well as for their compliments and praise for the work I did. This was an experience that means a lot to me and it’s one I won’t soon forget. Thank you. I picked up my prize the other day at the DML (see photo above the title of this article)! Unfortunately, I have a lot of work going on, so it’s going to be locked up in a safe place until that’s done. Still, it’s not like I could use it right now if I wanted to. My gaming PC hasn’t been touched in ages (since I don’t bring it with me to college) so I’m going to need to upgrade the GPU before I can actually set up the Vive with it. 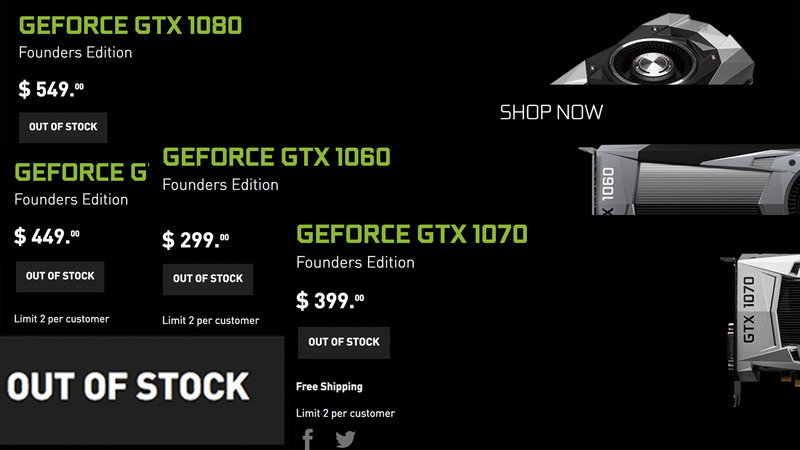 It’s a good thing there isn’t a spike in demand for high-end GPUs at the moment for cryptocurrency mining, right? Regardless of when I can actually use the prize I won, this experience was one I’m grateful to have had. The video I made is one I’m extremely proud of, and the journey I went on to create it is one I’ll think about for years to come. This entry was posted in Hardware, Library, Mac OSX, Software, Windows and tagged Contest, Editing, GPU, Graphics Card, HTC Vive, iMovie, Louison, Parker, Photoshop, Pitch, Ready Player One, Steam, video, Virtual Reality, VR, Win, Winner on May 11, 2018 by plouison. 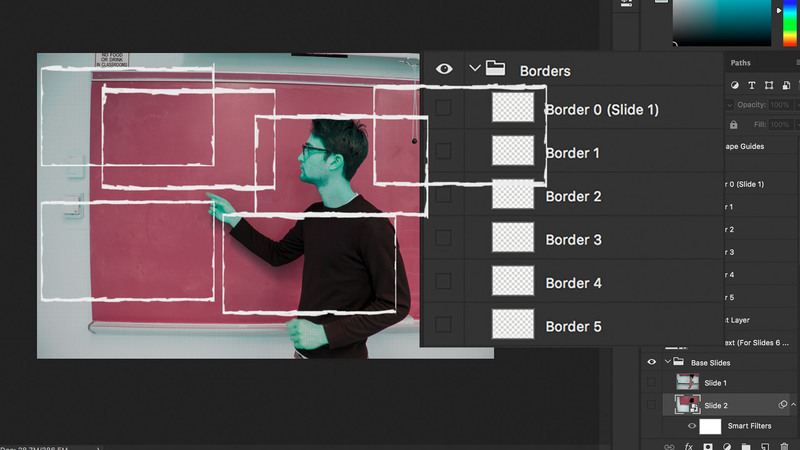 Have you ever found yourself watching tech tutorials online? Nothing to be ashamed of, as everyone has run into an issue they need help solving at some point in their lives. Now, have you ever found yourself watching a BAD tech tutorial online? You know, one where the audio sounds like it’s being dragged across concrete and the video is literally a blurry recording of a computer screen? It ironically feels like a lot of the time the people who make tech tutorials need a tech tutorial on how to make good quality tech tutorials. So join me, Parker Louison, as I wave my hands around awkwardly for ten minutes while trying my best to give helpful tips for making your tech tutorial professional, clean, and stand out among all the low effort content plaguing the internet! This entry was posted in Apps, Mac OSX, Software, Web, Windows and tagged Capture, Cleaning, Comedy, Editing, iMovie, Intro, Memes, Microphone, music, Parker Louison, Recording, Sound, Tech, Tutorial, video on November 7, 2017 by plouison.